Why is Unmanaged Stormwater Runoff a Problem? Unmanaged stormwater runoff can cause excessive erosion, flooding, and contamination of lakes, rivers, and surface water supplies of drinking water. Traditional site design has focused on managing stormwater runoff by estimating the peak runoff rate from large, but less frequent, extreme storm events - that is, how much stormwater runoff is leaving the site under worst case conditions - to ascertain if the receiving body, be it a river or stormwater collection system, can handle the anticipated flow. Detention facilities are built to slow down the rate of runoff to levels the receiving body can handle, with the outflow from the pond being controlled by the diameter and number of outlet pipes; the discharge rate can be calculated using a standard orifice equation. 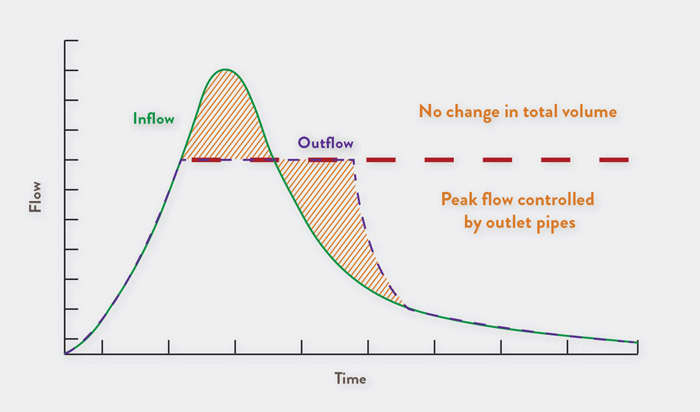 As shown previously, for FULL and PARTIAL EXFILTRATION systems any outflow is eliminated from the PICP area until the system design is exceeded. However, where either the native soils do not drain, or infiltration is not desired (underlying swelling clays or contaminated soils), there can be no reliance on infiltration so a NO EXFILTRATION system is used. What is unique to a NO EXFILTRATION system is the inclusion of an impervious liner underneath the storage aggregates; this turns the PICP system into a large detention device, with the available storage volume being the void ratio of the aggregate base/subbase. As the native subgrade soils are not exposed to moisture, there are no structural limitations on how long the water can be stored. On sloped sites, periodic benches are used to create a series of storage reservoirs that slow the water flow - this prevent all of the water from flowing down to the low end and overflowing out of the paver joints. The flow from each storage reservoir is controlled by the size and number of openings in the respective check dam.